Wooden puzzles can be simple shapes with few pieces for young children or they can be intricate and challenging designs for adults. A wood puzzle is created by drawing out a pattern of a shape, drawing shapes of the individual pieces, cutting the wood, and finishes with paint or decoration. Wood puzzles can be free standing shapes or flat cutouts with puzzle shapes that fit into the cutout. Homemade wood puzzle plans are plentiful, creative, and unique. Here are two examples of homemade wood puzzles for young children. The whale puzzle is made from ¾” pine or basswood that has been sanded. The wood is covered on both sides with clear packing tape before cutting. The pattern is prepared by cutting ½ “outside the line of the shape and attaching the pattern to the clear tape on the wood with adhesive spray. The outside shape is cut first using a scroll saw with a #9 blade. The inside individual puzzle pieces are cut next following the lines of the pattern. Once the puzzle is cut the pattern and tape is removed from every piece. Any rough edges are sanded with fine sandpaper. The wood is primed and painted with two light coats allowing the paint to dry between coats. Too much paint will keep the puzzle pieces from fitting together properly. The whale puzzle is for young children and has only five large puzzle pieces. This is a flat puzzle for a young child that is made with cutout shapes designed with flat bottoms so the individual pieces can stand alone. The pieces fit into a flat piece of wood with corresponding cutout shapes. This puzzle can be made with any shapes like flowers, cats or dogs. A pattern that is the same size as the piece of ½-inch thick pine is drawn with shapes that are cut out for tracing. The pattern is taped to the wood and the cutout shapes are traced in pencil on the wood. The shapes are cut out of the wood and all rough edges are sanded. The cut out figures are the puzzle pieces that can be painted with designs or faces. The wood that the figures were cut from is glued to a second piece of wood the same size, clamped or weighted down, and dried. This creates the puzzle base that the figures fit into and can be painted or decorated. 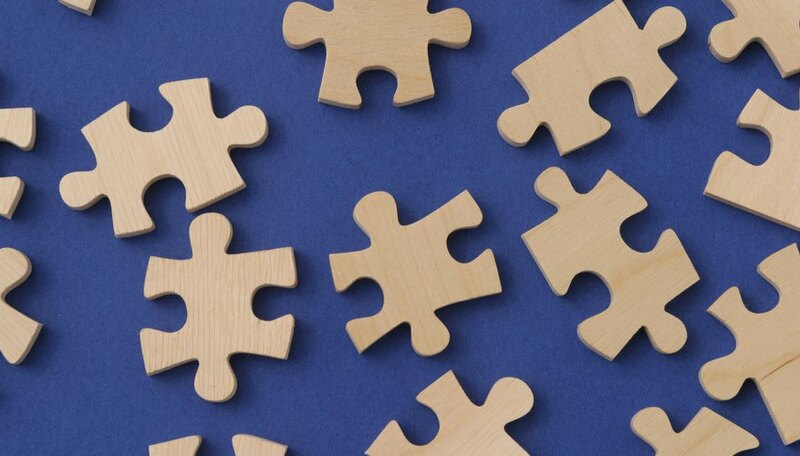 If you are making a homemade wood puzzle for a young child, be careful to make the puzzle pieces too large for a child to swallow and avoid sharp edges. Wendy Adams has been a Web designer, content writer and blogger since 1998. Her love for writing began in high school and continued with a life of personal writing, content writing, blogging, commentary and short articles. Her work appears on Demand Studios, Text Broker, Associated Content and on client websites and numerous social network sites.